From April 25, the Museum of Swiss Customs of Gandria will offer its visitors an exclusive experience. This is the Augmented Reality tour “Customs Museum Experience”, promoted by the Museum of Cultures in Lugano and the Swiss Customs Administration and developed in collaboration with Capitale Cultura International and ARtGlass. The project relies, as publishing partner, on the Radio-Television of Italian Switzerland, which has made available interesting films from its historical archives, never exploited before with this new technology. 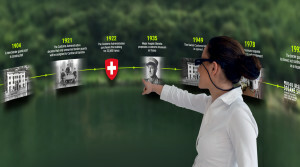 multimedia glasses that are perfectly transparent and capable of recognizing what one is looking, visitors to the Museum will come face to face with the customs officers who inhabited the Gandria border post and will enter the secrets of the smugglers, their antagonistic historians. Thanks to spectacular reconstructions at 360 degrees, it will be possible to discover the history of the Museum, recognize the places that can be admired from its windows and virtually open the smuggler’s wallet, unveiling its tools and the tricks of the trade. A real “time machine” that will thrill the many tourists who visit the house museum every year, bringing them closer to the great history and tradition of the Swiss Customs, institution famous throughout the world. The experience will be offered to all visitors for the price of 3 francs and will be available initially in three languages: Italian, German and English.